Weifang introductions: several suggestions regarding your stay, included instructions about tours and inexpensive solutions for hotels and rooms arrangement. 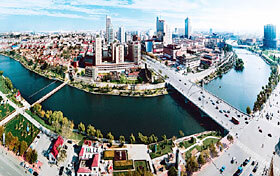 Hotels: Weifang and China reservation service, economical hotels at little prices. Travel: you can update about Weifang tours to discover the main highlights and to visit the famous tourist lands in the surroundings. The market of Weifang of " world kite city " lies in the middle part in the peninsula of Shandong, it is a new developing tourist city. Have jurisdiction over four districts, six market, two counties, area is 15,900 sq. 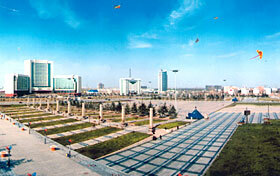 km., population is 8,630,000. Weifang own all kinds of scenic spot (district) 50 over place in common, hold many kinds of special good place of travel too. The kite museum, Shihu Garden, exquisite mountain, the museum of Qingzhou, the mountain prosperous extinct plants and animal fossil museum, Stone Tomb of Han Dynasty Portrait of Anqiu, the mountain of cloud door, Tuoshan Mountain, Mr Fan pavillion, old dragon gulf, the crossdrift workshop of Linqu, the Weifang kite museum, Yi mountain, the crossdrift workshop.